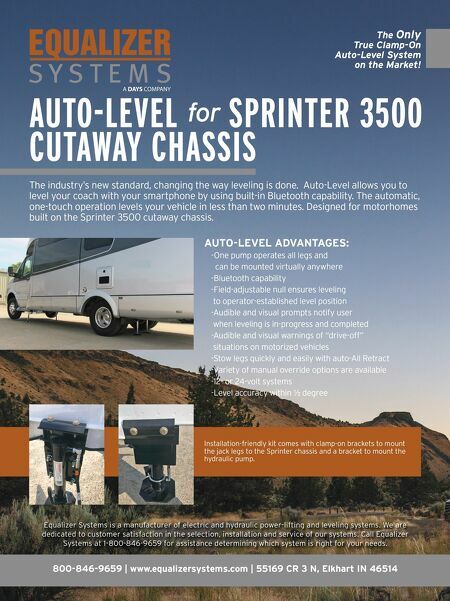 AUTO-LEVEL for SPRINTER 3500 CUTAWAY CHASSIS The industry's new standard, changing the way leveling is done. Auto-Level allows you to level your coach with your smartphone by using built-in Bluetooth capability. The automatic, one-touch operation levels your vehicle in less than two minutes. 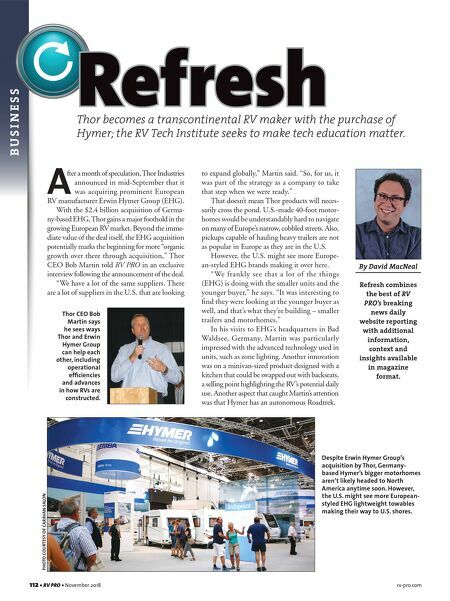 Designed for motorhomes built on the Sprinter 3500 cutaway chassis. AUTO-LEVEL ADVANTAGES: -One pump operates all legs and can be mounted virtually anywhere -Bluetooth capability -Field-adjustable null ensures leveling to operator-established level position -Audible and visual prompts notify user when leveling is in-progress and completed -Audible and visual warnings of "drive-off" situations on motorized vehicles -Stow legs quickly and easily with auto-All Retract -Variety of manual override options are available -12- or 24-volt systems -Level accuracy within ½ degree The Only True Clamp-On Auto-Level System on the Market! Equalizer Systems is a manufacturer of electric and hydraulic power-lifting and leveling systems. We are dedicated to customer satisfaction in the selection, installation and service of our systems. Call Equalizer Systems at 1-800-846-9659 for assistance determining which system is right for your needs. 800-846-9659 | www.equalizersystems.com | 55169 CR 3 N, Elkhart IN 46514 Installation-friendly kit comes with clamp-on brackets to mount the jack legs to the Sprinter chassis and a bracket to mount the hydraulic pump.